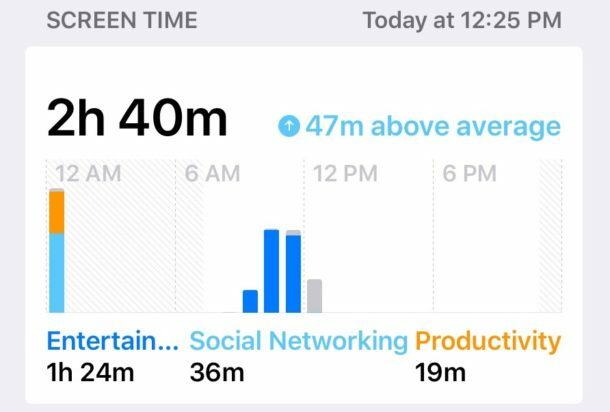 Screen Time is one of the best features in iOS 12, allowing you to keep track of how often an iPhone or iPad gets used, what apps are being used, and perhaps best of all, Screen Time gives you the ability to easily set time limits for apps and categories of apps, and even set restrictions on content and privacy. 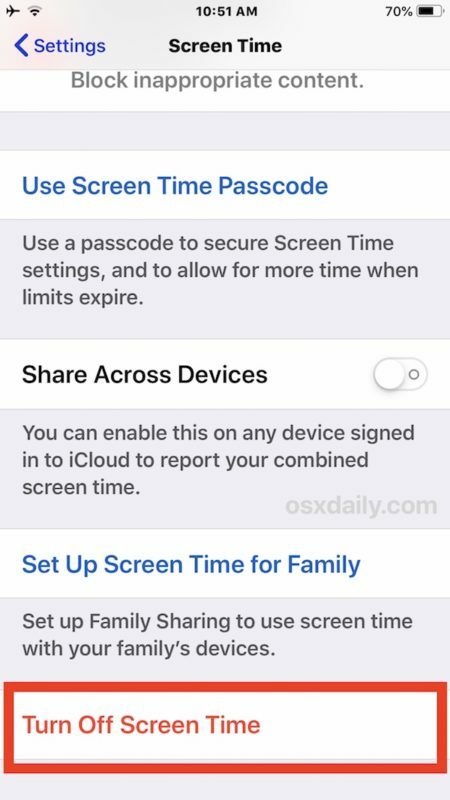 While many iPhone and iPad owners will appreciate Screen Time, whether for better understanding their own device usage or for managing a childs device or someone else’s, some iOS users may also decide they do not want the Screen Time feature enabled and reporting usage data points or limiting app use at all. If you want to turn off Screen Time completely in iOS 12 for iPhone or iPad, this tutorial will show you how to do so. Note that by turning off Screen Time you will no longer be able to see the daily and weekly charts of device usage, app usage, reports on device pickups, limit apps use, limit device use, or any of the other associated features. However, it’s also noteworthy to point out that some users who found that iOS 12 battery life is worse anecdotally discovered that disabling Screen Time can improve their devices battery life. Whether or not you wish to use the feature on an iPhone or iPad is entirely up to you. 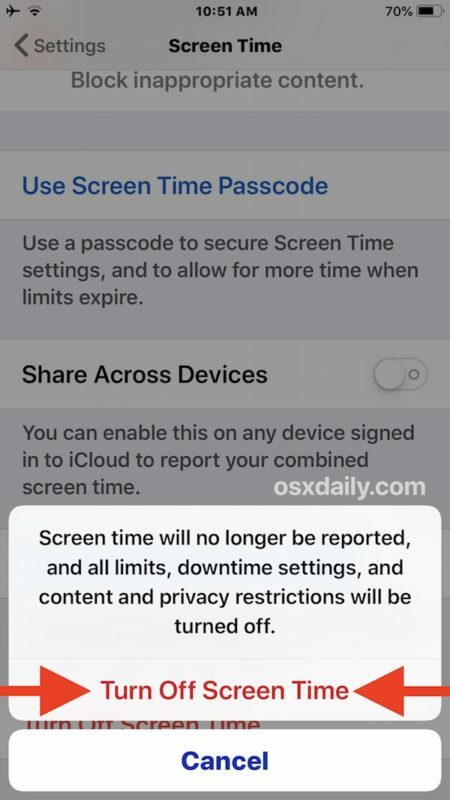 Once Screen Time is off you’ll no longer have reporting of app use and device usage, you’ll no longer have time limit options on apps or device use, and all content and privacy restrictions are disabled as well. With Screen Time enabled again you can configure the options to limit iOS device use, restrict app usage, and much more. 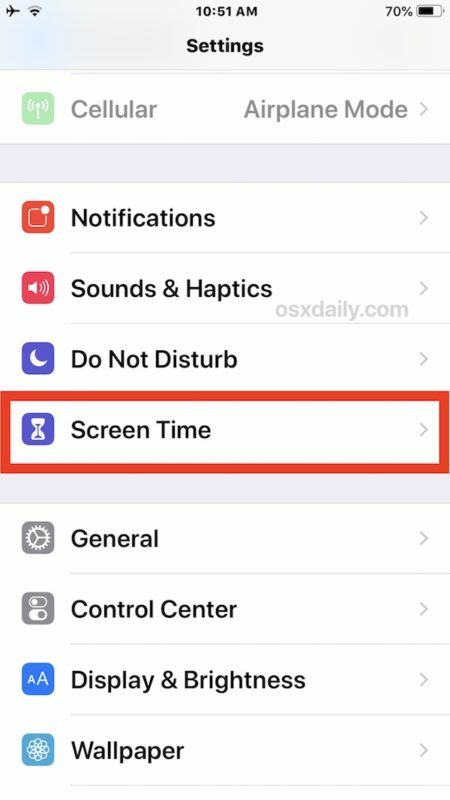 Screen Time in iOS is kind of like parental controls (or even self controls), so if you’re hoping to set a daily time limit of 15 minutes for social media apps or 20 minutes for gaming, or 10 minutes for a particular app, it’s very easy to do exactly that.